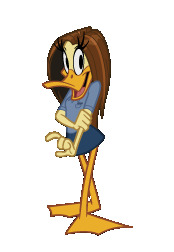 Tina Russo 오리. . Wallpaper and background images in the The Looney Tunes Show club tagged: the looney tunes show tina russo duck. She could do soooo much better. But I find their relationship cute.Daffy needs her. She could do WAY better but they make an awesome couple!